While in Las Vegas, Flash called Betty to break up with her as he didnt want her to get hurt because of him. Later Venom was faced by Red Hulk who came to take the Symbiote back and to deliver Flash to his court-martial. In the middle of the battle, Blackheart opened a portal to bring Hell to Earth, but only managed to bring a part of it. 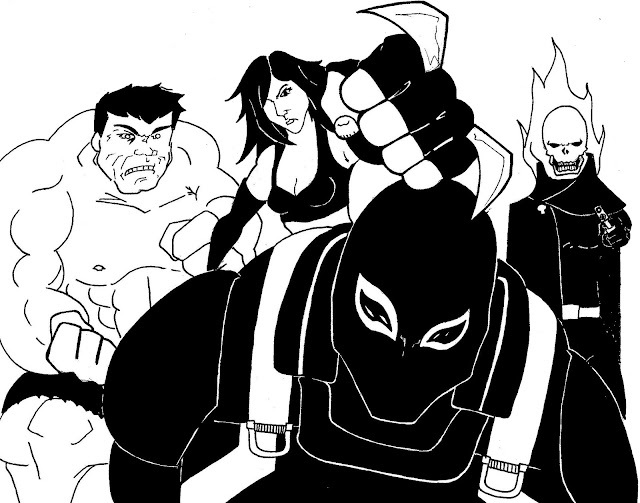 Trying to find who was responsible for this, Venom and Red Hulk found themself alongside X-23 and the new Ghost Rider about to battle Blackheart. The villain created Anthiteses of the four heroes to battle and torment them, Flash's being an Evangelist who used the symbiote, his father and his drinking problem to fight him. Although the heroes battled well, they where ultimately killed. Flash's neck was snapped by Blackheart's girlfriend Gari Oyle after he murdered the Evangelist. In Hell, Mephisto offered the heroes a new chance to live in exchange for defeating Blackheart. They managed to get the Spirit of Vengenace, which had been trapped by Blackheart, and wanted to get it to Blaze, so he would become Ghost Rider again. During the battle, Red Hulk and Venom were thrown away by Blackheart, Flash gave the symbiote to Red Hulk and it bonded with him as well as the Spirit, thus becoming the new Ghost Rider. Blackheart was defeated when Ghost Rider used a mirror which creates Antithesis, being defeated by his. Meanwhile, Flash and X-23 were trying to help Johnny Blaze to return Hell from the dimensional portal and destroy it. When Las Vegas returned to normal, Red Hulk returned the symbiote to Flash and the Spirit of Vengeance to Alejandra. When the Secret Avengers arrived, Captain America tried to take Venom to custody, but he convinces Cap to let him joing the Secret Avengers, so Giant-Man and Beast would try to make the symbiote more controllable.